Happy Friday everyone! I hope you all have a wonderful weekend!! Nothing captivates me quicker than polka dots. Love the cute polka dots dress! Omg you look marvelous. I love the cute polka dot dress! love the simple chic style! this outfit is very you! I love the layered dress look! Can’t wait to try it on for myself, such great inspiration! I love the way you paired the shirt under the dress! Love your dress, it’s cute and classy at the same time! It is a simple look but I love it. The dots and red look so good together! Love those polka dots! What a great work-appropriate outfit. What a cute outfit. Love the red touches. Obsessed with the shoes! Fabulous layered look! How cute is this outfit? I love it and want to wear it to a holiday party! Fun dress. Love the colors! It is great you can wear tights with Valentine heels. This polka dot dress is too cute! This is adorable! I’m going to definitely have to re-create this look! Happy Friday ya’ll! Super cute polka dots for the holidays! This look is SO darling. Those black heels are a perfect addition! What a cute look! It reminds me about Mimmi Pigg! Love the dress. Polka dots are my life! 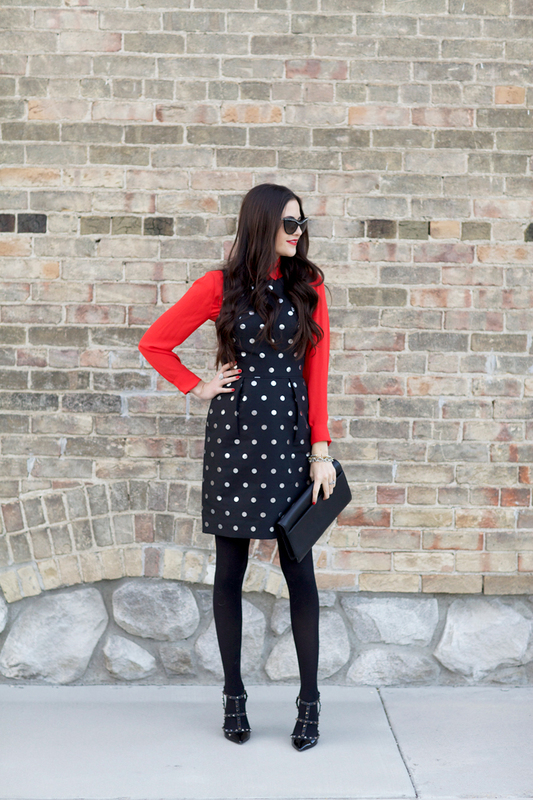 How fun are those polka dots – love this look! LOVE this dress paired with the red! I LOVE that outfit! What a great style that it looks like it can be easily dressed for work or the evening. You have been ‘spotted’ to have great style Rachel! Love the pop fo red! Another fab red look! Your killing it! Gorgeous! Please tell me where your ring (middle finger) is from? I love it! Hi Rachel! Love this look. I have never layered a blouse under a dress, but you have really inspired me to try! Thanks for sharing. Very pretty look & so glam! You hide that bump so well too. This is so adorable! Perfect for a family holiday gathering. Such a stunning look! Love the polka dot dress! 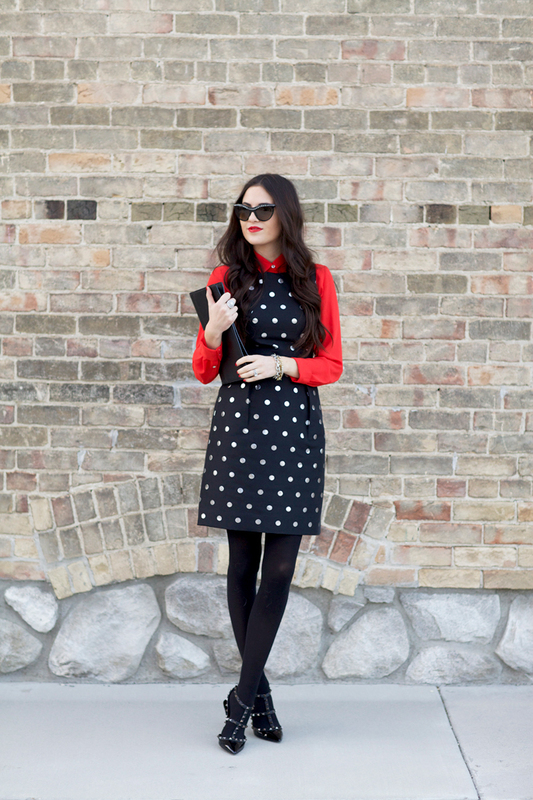 Love the combination between the red shirt and the polka dot dress. Lovely outfit. This is the cutest outfit! I love it and so chic! You have the best style! Love your shoes! awww this is super cute! I love those tights with those valentinos. 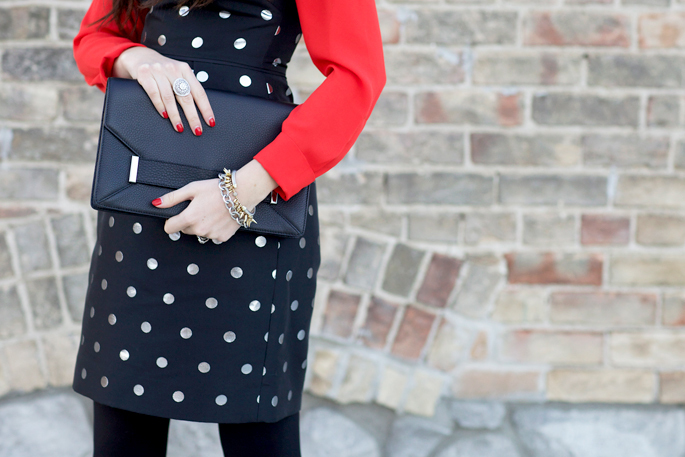 I love the b+w polka dots paired with red! Adorable! Love how patriotic this look is! Oh how cute!! Love this dress!! Love the red and the polka dots!!! So chic! I love your Valentinos! Great look, love the colors. Perfection! I love the red. Such a cute and sweet look! I’m truly excited for you and husband’s bundle of joy arrival. But we all want to see the nurser. 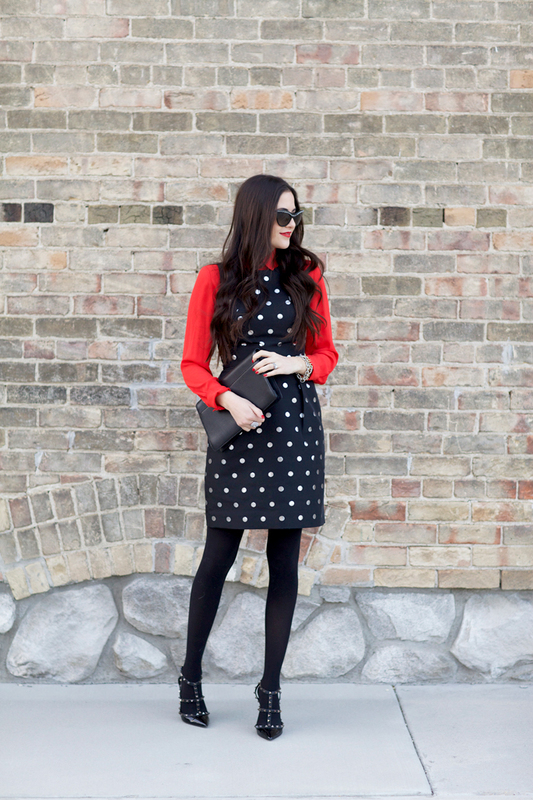 Love this preppy chic look with a classic polka dot dress and a bright red blouse which captures attention instantly! The studded design of the shoes also add a touch of edge to the outfit, cool! Just gorgeous – absolutely love this look!! You look absolutely gorgeous!! Love the combination of the dress and red blouse from J Crew. I actually own that dress as well :). Amazing outfit, love the red blouse! love the black and red combo! Those layers are so perfect! That is such a flattering dress on you. Love that dress and those shoes! You look so cute! Congrats on the bambino! This dress is gorgeous, What a cute outfit. What a gorgeous look! You’re going to be one hot mama!